Ganges sewer outfall sign. 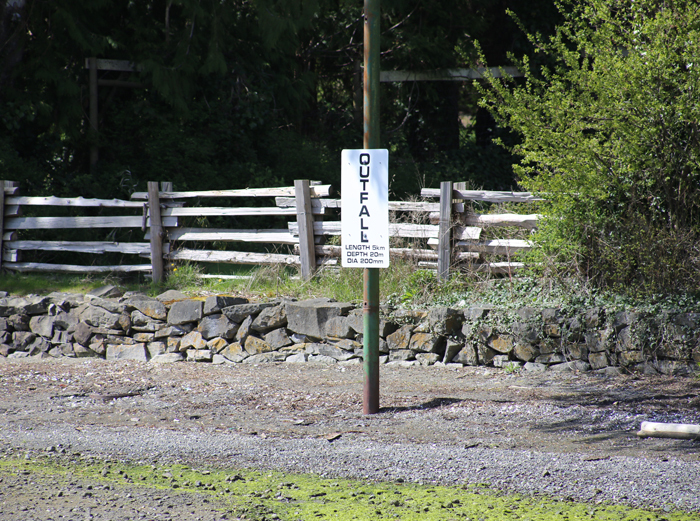 People are being advised that maintenance work at the sewer plant means untreated sewage will be released into Ganges Harbour (well beyond this sign!) between Aug. 16 and 28. A change in treatment due to upgrading work at the Ganges sewer plant means wastewater will receive preliminary screening only before being pumped out the long ocean outfall in Ganges Harbour for a period of two weeks. The Capital Regional District has announced a wastewater bypass is required during upgrades to the treatment plant taking place between Aug. 16 and 28. Much of the original 33-year-old equipment in the plant needs to be replaced. Sewer materials will undergo solids screening but will not undergo the normal treatment process during this period. It is recommended that anyone who comes in contact with ocean water within 500 metres of the outfall discharge point should wash themselves off as a precaution. Approvals for the bypass have been received from Environment Canada and B.C. Ministry of Environment. A marine water sampling plan will be implemented to test the water quality in the ocean at nine locations from Ganges Harbour to Swanson Channel before, during and after the bypass. A temporary shellfish closure will be implemented from Ganges Harbour to Swanson Channel and will remain in place until at least 21 days after the bypass ends.